Colouring: Copics, bit of distress inks around paper edges. 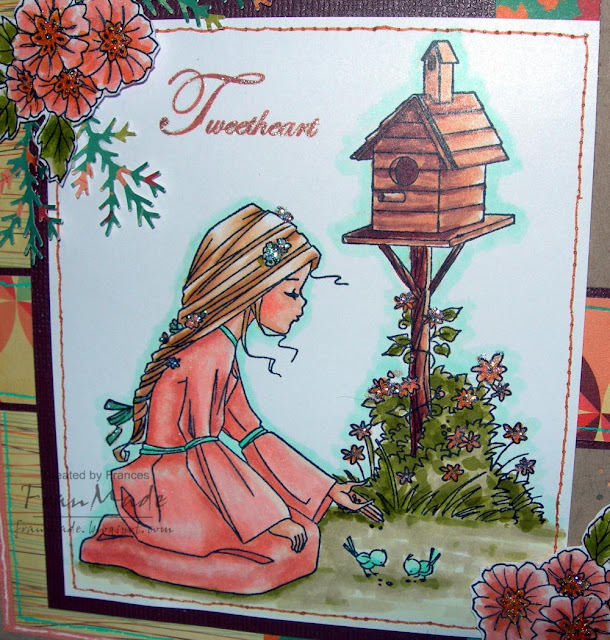 Here's another card using stamps from the WoJ 'birdie love' Feb stamp kit. 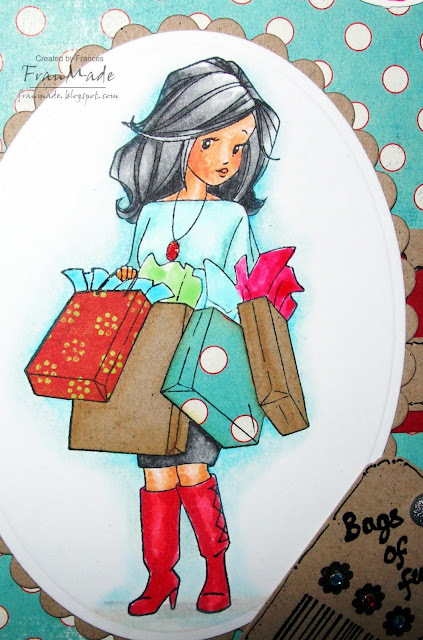 I used some of the accessories stamps to make the background too - not that you can see much of it now but this is what it looked like before I added the image etc . . 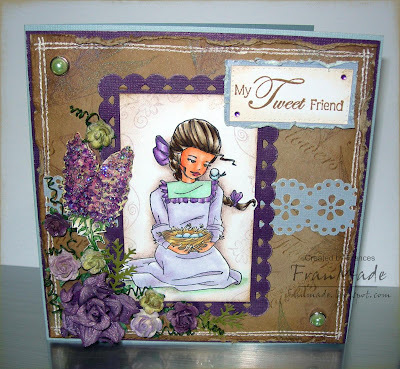 I just stamped the flowers with versamark onto piece of kraft card then dusted pearl ex powder over it in greens and purple. Think you can see how it shimmers when it catches the light. Then I sponged distress ink around the edges, stamped the text randomly over it and then distressed the edges and added the faux stitching to finish. The main image has been coloured with Copics but then I also added shading with my prismacolor pencils for a change and added some swirls around the edge (another WoJ stamp). 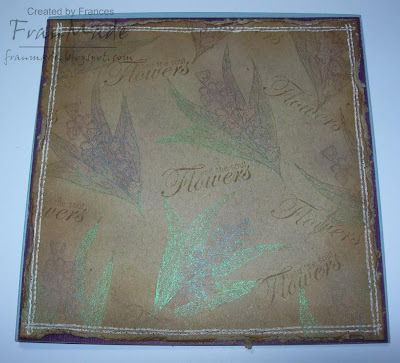 The flowers have been sprayed with glimmermist and the stamped flower is another stamp from the kit which has been coloured then stickled. Thanks for visiting, always appreciated ;) Not working this weekend so may have another card or 2 to show depending how crafty I feel. Hope you all have a good one. Colouring: Copics with a bit of prismacolour pencil around the image for the shadows. It's CCT again - gosh the weeks are flying by. This week's theme is ribbon-tastic. I've gone for simple/easy option and just used 2 decorative ribbons on my card - the blue velevety one at the top and the yellow popm pom strip at the bottom. 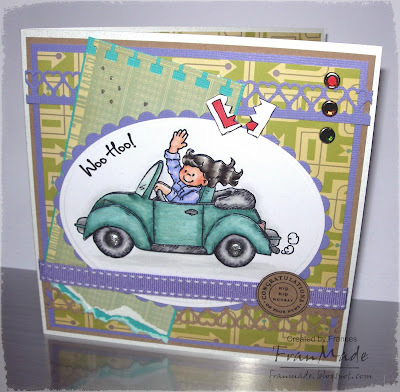 I love this Mo Manning stamp and thought she looked quite retro so found some paper that screamed retro to me and kept the rest simple as the paper's quite busy. Others: ribbon, mini gems in centre of flowers and in/around butterfly. 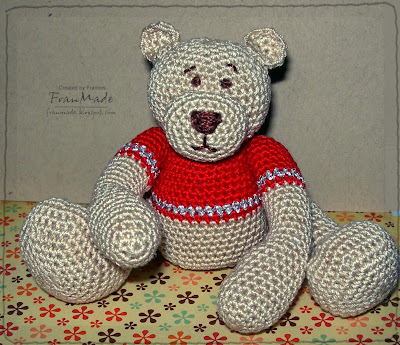 No card today, so thought I'd show you the tiny little crochet teddy I managed to finish. he's been slowly building up and sitting in bits on my desk for the last month like this . . . Thank you for the get well wishes - I'm much less drippy now and almost back to normal (as normal as I can be!) Should be back with a card Thursday if not tomorrow too. Have a good evening - it's very cold here. Tried to snow earlier but didn't last long. WoJ Biride Love Stamp kit: "tweetheart"
I just love this set and if you look on Katharina's blog you'll find news of another kit which is exclusive to WoJ retailers only and which I think compliments this kit perfectly - I will be working with both sets over the next 2 months so keep an eye out. Have a lovely Sunday and hope you're all germ free! As I was making this card for my neice I thought I may as well use it for my CCT card which this week is 'metal mania'. So for mine I have added sparkly metal brads to the centre of the 2 wheels and the 3 metal/gem brads in the corner to look like traffic lights. As always, thanks for dropping by and have a good day! Hello! Hope you all had a lovely weekend :) and a good start to the week. Got another 'slow burn'/collagey card to show you today. Fancied using some of my 'old' Sarah Kay stamps which have not been used yet (shame on me!) 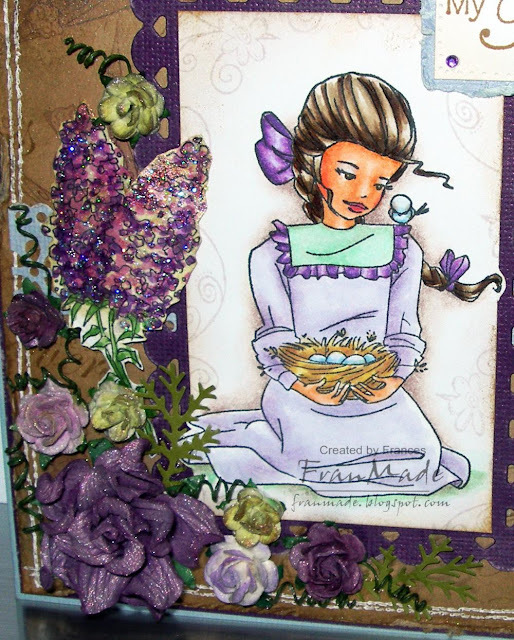 so pulled this one out and teamed her up with some BG 'Origins' paper and messed around with it all until it ended up like this! I wasn't that happy with it when I finished but now that I look at it again after leaving it a while I think it's growing on me. Again it's all very much more 3D IRL (image and 1 of the circles are raised on foampads). Hiya, today's card is one I've been playing with for the past day or so -yup, it's another one of those slow brewing kinda cards but I think it was worth it as I really like how this one turned out, even if I do say so myself LOL . 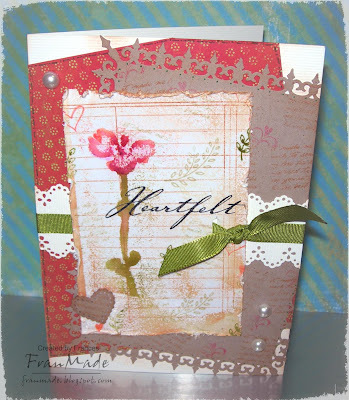 This card all stemmed from the spare heart cut out from messing around with my last card along with all the scraps of DP (BG 'sugar rush') from it. Then I wanted a sitting figure so thought it was time to crack open the Miss Anya set I got for christmas and use this little beauty! No particular challenge in mind though I'm sure there's a few it would fit this week with all the love and heart themes floating around. 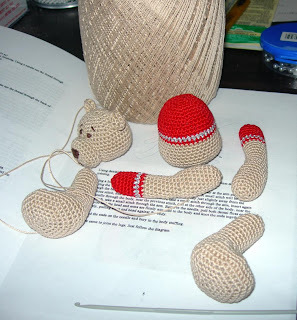 It's all very 3d which I have tried to show with this photo but not very successfully! There's lots going on in terms of what I used but mainly little things (which is what took the most time really); like I've glittered the tiny hearts with diamond dust and the flower's been spritzed with glimmer mist. 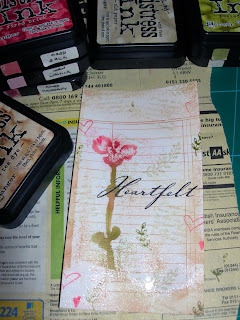 The background heart is handcut after stamping a Hero arts lace stamp and adding another handcut scallop border. Lots of faux stitching which I think really finishes it off (it didn't look right without it). Flowers made from various punches and the eagle eyed amongst you may see my new MS loopy heart border punch which I have punched twice to create the thicker band you see here - it's sooo versatile and I love it - all the little hearts around her are the punched out waste bits from the border :). Everything else is my usual - Copics to colour. 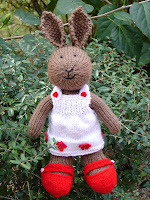 Oh, one last thing if you'd like somebunny to love, how about this lil' cutie? As it's Valentine's this Sunday it'll be no surprise as to what CCT's theme is this week - 'in the name of love' although it doesn't have to be a valentine card just with a love theme. Well, I made a Valentine's card for hubby so kept the flowers and frills off and used twill ribbon and metal brads instead (my 'go to' for embellishing 'men cards'!). 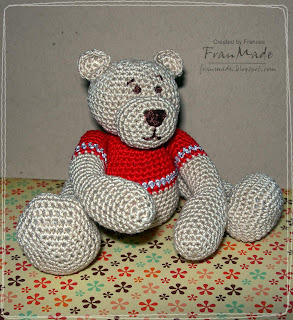 Although couldn't resist adding some gems and sparkle - he won't mind! 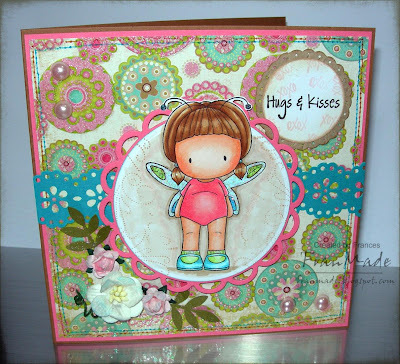 Also got to use my new cuttlebug embossing folder - thought it was about time I actually had a heart one in my collection and I love this new one, it's called 'kimmy's luv'. As usual my photo fails to show how 3D & sparkly this is as both the cute couple and the little 'love' heart are raised up with foam pads and his tie, her shoes and dress trim have been stickled for sparkle - probably see that better if you click on photo for closer view. 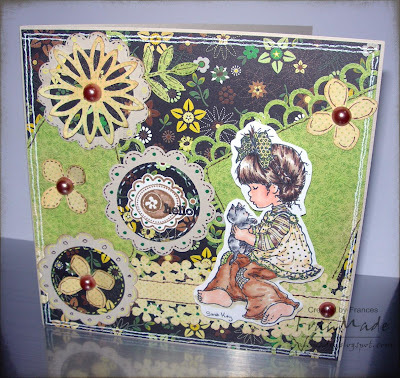 Stamps: Emma & Trevor from CC Designs' limited spring kit (will be released as individual stamps later - Silly Monkey's will have them, not sure of date yet though). 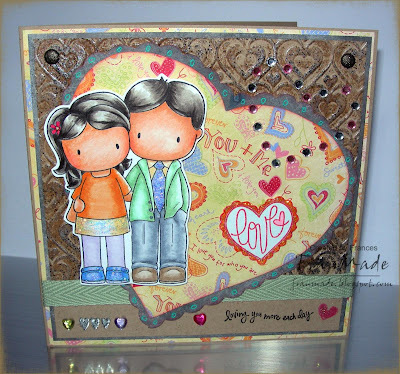 The fab little sentiment and 'love heart' are from BG mini stamp set from their new delta range. ( HAD to get some as they have this fab curly font which I love - got the Happy birthday one too which is great as I keep seeing Melissa Frances rub ons with this font which I adore but can never seem to get hold of). Tools: just scissors - normal & pair of decorative scallop ones to cut out my hand drawn heart in the background (never did get round to buying the heart nesties - will do eventually but always something else I'd rather get! 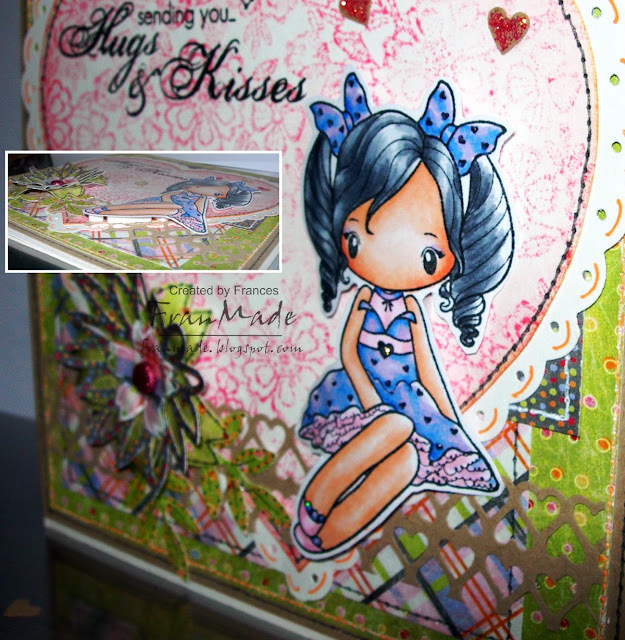 ), 'Kimmy luvs' heart cuttlebug embossing folder on the back which has also been swiped with versamark dazzle pad and heat embossed with mixture of clear & grey embossing powder for a mottled look. On that note, I'm off to go make good use of all these things I 'had to have' at stome stage or another, you'd best go do the same with yours! As always, thanks for dropping by else I'd be typing to myself :). Hello & it's back to cute today. 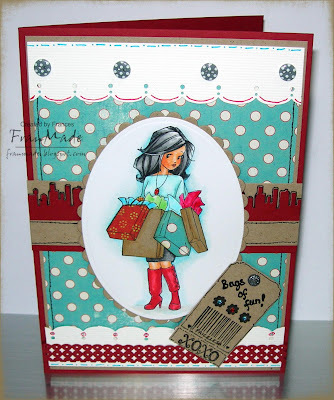 I've used another of the 'City Girls' stamps from WoJ and I couldn't resist adding the 'bags of fun' sentiment and I got to use my 'cityscape' MS border punch (behind her) which I think goes fab. Now for some reason she looks like she's been tango'ed but her skin isn't that orange in real life, honest! Maybe this close up will look less orange . .
hhhmph, she does still look a little too sunkissed doesn't she?! Oh well! It's not a square card for a change, only because I had this card base sitting on my desk (was supposed to be for my last card but decided on white base for that in the end). So then, the layout just grew from that. 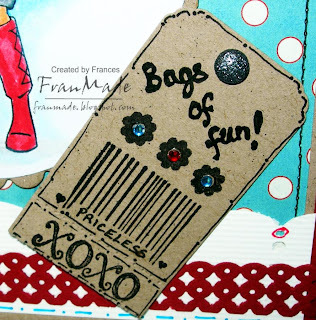 Decided to do a little paper piercing for her shopping bags and my favourite bit is the little price tag I made using various mini stamps from the umpteen 'studio g' mini sets I have, a bit of doodling and a corner rounder punch . .
That's all from me today, hope you're all having a good week so far. Hello, hope you're all having a good weekend. 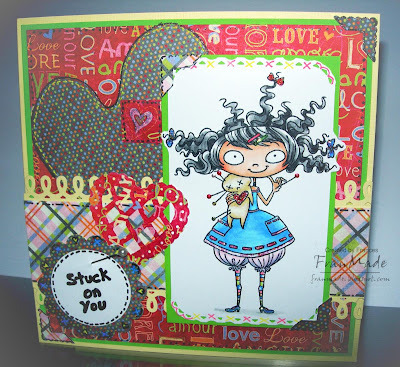 Card today is a non cute one - I know, shocking! But every now & again I get the urge to mess around with just stamps & inks (which is how this stamping bug started for me before I discovered prismas and copics and the influx of all these cute character stamps). 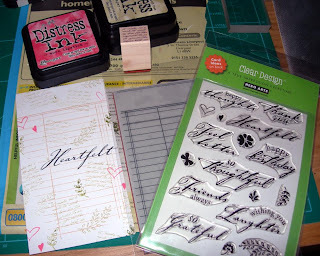 Just basic resist embossing stamping and good old distress inks. In case anyone interested, here's quick run through of how I did it. Starting with piece of white card, stamp what you want to be in the background onto it. 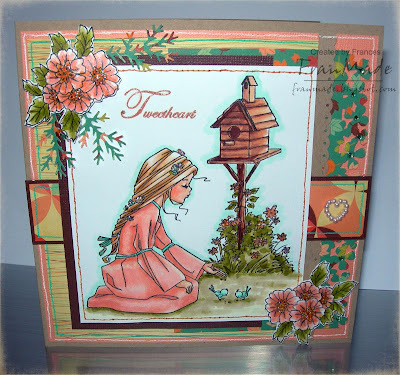 So on mine I added the lined notepaper stamp, the 'heartfelt' sentiment and some random small images in various colours of distress inks. 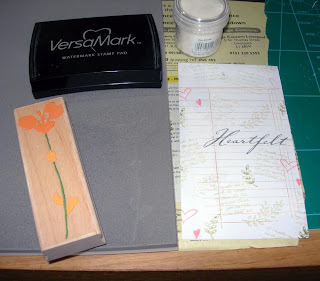 Then I found this lovely old flower stamp and created a 'reverse' stamp out of it by heating the grey side of a piece of 'cut n dry' foam pad and pressing the stamp into it (you can just about see the impression in the photo). 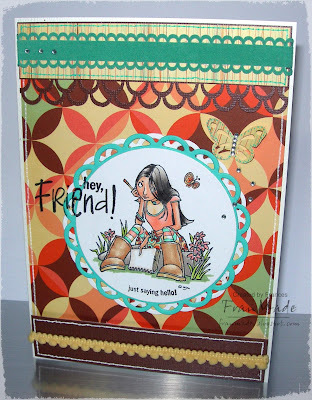 You can miss this step out if you already have a suitable stamp (Heroarts have some fabulous new stamps just perfect for this technique which is what got me started to see if I could use what I already had). 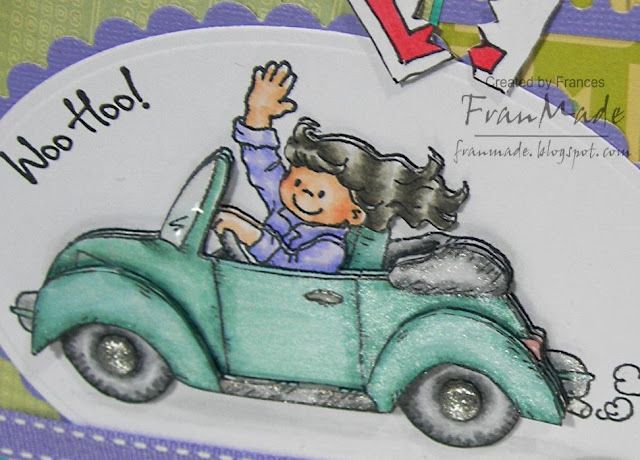 I then inked the 'cut n dry' impression with versamark inkpad and stamped it onto my piece of stamped card and heat embossed it with clear embossing powder. This way, the only bit of card which isn't embossed now should be the impression of the flower. By using various distress inkpads I sponged the colours on to reveal the flower and all the imperfect bits around the edges where it didn't emboss properly. Give the whole piece a buff with kitchen towel and job done. Then I just cut down to size and distressed and inked the edges before making up into card. Obviously had to use my Martha border punches in there somewhere and I seem to naturally want to make all my layers 'wonky' so not quite sure what that says about me LOL Think it would have looked better with some stitching around the layers but I still not got myself a sewing machine so will have to do without for now. Thanks for swinging by & enjoy what's left of your Sunday. P.S anyone looking for winner of WOJ candy - it's below this.